The Students Working Against Tobacco (SWAT) Team at Royal Palm Beach High School during Kick Butts Day. After months of planning, a student SWAT Team descended on the courtyard at Royal Palm Beach High School on Wednesday, March 27 and set up a command post from which they launched their deadly serious campaign to save student lives. Their mission? To kick butts! They armed students with the facts and scientific information about how tobacco products are not only dangerous, but they are totally uncool. In this case, SWAT stands for Students Working Against Tobacco. 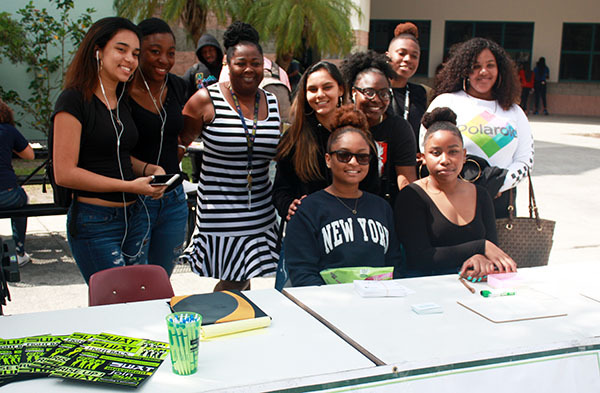 The SWAT Team at Royal Palm Beach High School joined thousands of other young people nationwide last week to mark Kick Butts Day, an annual day of youth activism sponsored by the Campaign for Tobacco-Free Kids. More than 1,000 events occurred across the United States. This year, the peer-to peer kids are focused on kicking Juul, the e-cigarette that has become enormously popular among youth across the country. “People who vape look like fools. I would never date a boy dumb enough to smoke,” said student Esther Saintil, who stopped by the SWAT outreach table in the busy courtyard. Grant looks forward to attending the University of Florida next year, where she plans to work toward a career in medicine. Alisha Maragh, a SWAT officer, said that the group’s mission is important. “By peers telling peers about the dangers of vaping, it’s an incredible way to make a difference and maybe even save someone’s life,” she said, noting that she is especially proud that she helped inspire her uncle to stop smoking. While cigarette smoking among high school students nationwide has fallen to 8.1 percent, e-cigarette use among high schoolers rose by an alarming 78 percent in 2018 alone — to 20.8 percent of the student population. In 2018, more than 3.6 million middle and high school students used e-cigarettes. U.S. public health leaders have called youth e-cigarette use an epidemic that is addicting a new generation of kids. In Florida, an alarming 24.8 percent of high school students use e-cigarettes, while 3.6 percent smoke cigarettes. 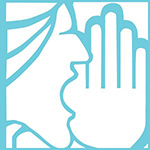 Tobacco use claims 32,300 lives in Florida and costs the state $8.6 billion in healthcare bills each year. On Kick Butts Day, youth and health advocates called for strong action to reverse the youth e-cigarette epidemic. In particular, they called on the Food & Drug Administration, state governments and local governments to ban all flavored tobacco products, including e-cigarettes in flavors like cotton candy, gummy bear and mango that tempt kids. Key facts about e-cigarettes include the fact that the main cause of the youth e-cigarette epidemic is Juul, which looks like a computer flash drive, is small and easy to hide, delivers a powerful dose of nicotine, and comes in kid-friendly flavors. According to the manufacturer, each Juul “pod” (cartridge) delivers as much nicotine as a pack of 20 cigarettes. E-cigarettes pose serious health risks for kids. The U.S. Surgeon General has found that youth use of nicotine in any form — including e-cigarettes — is unsafe, causes addiction and can harm the developing adolescent brain, affecting learning, memory and attention. Studies also show that young people who use e-cigarettes are more likely to become traditional cigarette smokers. The RPBHS Kick Butts event took place in coordination with Tobacco Free Florida and the Palm Beach County Department of Health. For more information, visit www.swatflorida.com.